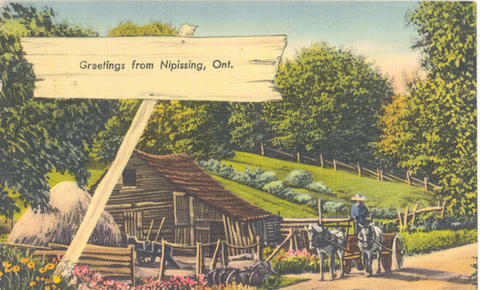 Item 055 - Greetings from Nipissing, Ont. Postcard was cancelled at Powassan, Ontario on 8 July 1952. Card is addressed to: Mr. & Mrs. L. St Clair. 833 S. Coldbrook Ave. Chambushbury. Pa. U.S. Message reads: Hi Kid. This is some place. Fish. some swimming & lots of boating. The Finks.